Curtains are back. I know, where did they go? Well it seems for awhile there, the design world felt that simple roll up blinds were quite enough. And they had a point, keeping your windows as clear as possible does help make a room look larger and brighter. But so what, if it’s also boring! So whether you use simple side panels to add some oomph to your blinds, or make curtains and drapes your main window coverings… add them. Please. The color, pattern and interest they add to an area as large as your windows will be that thing. You know, the thing that changes your room from good, to aha? 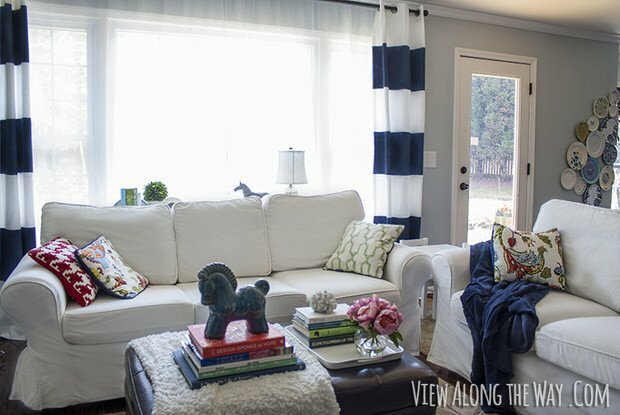 These DIY curtains & drapes are easy to make, save you money, and allow you to create a custom look for your space. First, a couple of quick tips for those of you worried that hanging curtains will make your room look smaller. Always hang your curtains all the way to the ceiling, and far enough apart that the curtains totally clear the windows when open. If using a solid fabric, use a color similar in value to the wall. The closer it matches the wall, the more it will visually disappear. If using a pattern, use one with a white background. It just looks fresh! Oh, and the white visually expands space. Don’t get fussy. We aren’t talking the pleated, traditional drapes of the past here. Keep it light! From Kelly at ‘View Along the Way‘, create your own look with her striped DIY curtains tutorial. I love stripes for a small room because they lead the eye, making the room appear larger. You could also use a lighter color stripe. I have featured this amazing room of hers before, in our post on Warm Modern Decorating over at TBD… Love Kelly! Gorgeous room! Laura at ‘The Soulful House‘ has another take on painting stripes on DIY curtains. She only used the stripes as an accent, instead of throughout the whole drape. This can enlarge the look of a room also, by leading the eye from side to side. Also a great plan for small rooms. Oh, did I mention her project is a no-sew curtain? And a Ballard Designs knock-off? Sarah from ‘The Yellow Cape Cod‘ went a step farther with her bold striped DIY drapes, and she used a different technique for making curtains. These are not done with paint, but with fabric and an iron! Oh, did I mention, another no-sew project? Love that! And yes, I love the bold stripe, even for a small room. Why? Sometimes you need a star in the room, no matter what. And they follow my “white background” tip above! Ok, let’s go a new direction here. How about this really feminine, ruffled DIY curtains tutorial from Rachel at ‘Maison de Pax‘? These have great detail, but also work great in a small space because of the light color and feel. Of course, you could make them in any color you wanted! So soft and pretty! Be sure to check out her photos and see how amazing these look in her bedroom. Our next project is from Summer at ‘Simple Stylings‘. I love her tutorial for her no-sew cafe curtains! First, cafe curtains are great for small rooms because they always let in light, even when closed. Also, she uses a fabric shower curtain from Target as her fabric choice. I used one to cover my headboard! Great way to find trendy fabrics in wide widths for DIY window treatments. One of the biggest problems we have when using curtains, or any DIY window treatment is “how do they look from outside”? We are going to jump back over to Kelly at ‘View Along the Way‘ ’cause she has this great tutorial on how to sew lined curtains. The neutral lining not only makes the curtains look amazing from the street, they also add insulation to keep out light, heat and cold. Want something with a little more glam? 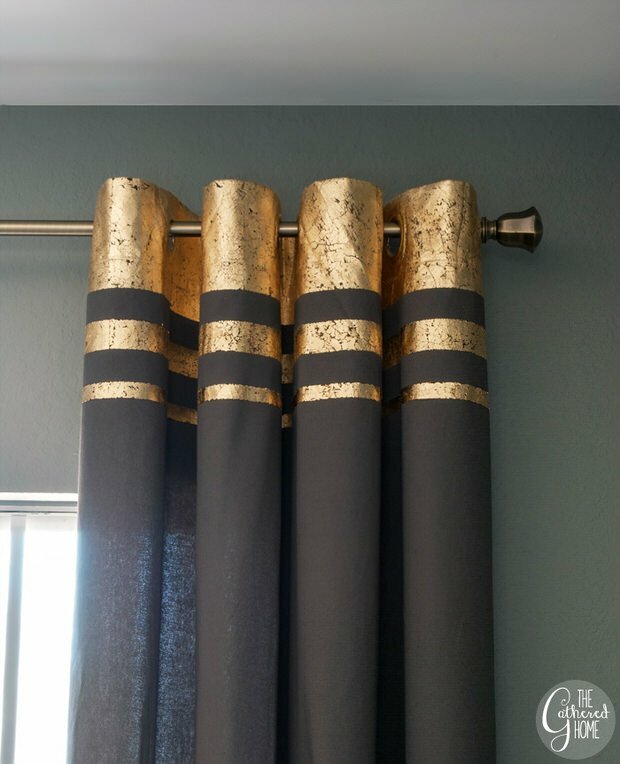 Try the tutorial for gold leaf embellished DIY curtains from Brynne at ‘The Gathered Home‘. Easy and detailed tutorial with lot’s of photos makes learning how to make curtains simple! I would love to see this done on a coral or pink curtain for a “rose gold” look. How amazing is this? And so less expensive then buying them! Want fast? Try these 5 minute drop cloth no-sew curtains from ‘Thoughts from Alice‘. Easy, fresh, simple DIY window treatments… what more could you want? Try this vintage scarf DIY curtains project from Kate Pruitt via ‘Design Sponge‘ if you want a more bohemian look. Amazing paired with the modern mid-century style chair and table. Looking for inexpensive? Try using burlap! This ruffled burlap DIY curtain tutorial from ‘The Caldwell Project’ will get you on your way, complete with tips on how to cut this fabric. Burlap is totally on trend for any style home. The texture alone is an amazing detail. We saw this curtain idea for using a braid technique on ‘Houzz‘… Unfortunately, try as we might, we could not find a tutorial for this! Has anyone seen a DIY curtains project that we could link to for instructions? Share with us in comments! Update : You can find a quick tutorial to this idea at ‘Home DZine‘! Lastly, a quick idea for a creative way to hang your curtains. Try using rope like in this photo by ‘Traditional Home‘. So simple, you wish you thought of it, right? Ok, so now that you know all about DIY curtains & drapes, jump on over to our posts on How to Reupholster Almost Anything and 16 DIY Headboard Projects! Because, DIY! To make a basket-weave panel, start off with 7 strips that can be folded in half over the curtain rail and hang to the floor. Cut 3 strips of fabric for the basket weave. Place the  strips on the rail or rod and weave the  strips over and under the fabric. Close off the  strips at the back. I have white counter tops and white ceramic floors and ktchen table is Roxton with four chairs and a sliding door that looks onto the deck/back-yard I need some ideas about window converings,not sure is bamboo would be the way to go?? or any ideas would be greatly,big open concept gully type kitchen with windows over the sink as well all one big kitchen with 2 bay windows on both sides of the sliding doors. How far should curtains come to the floor if you have an electric baseboard heater below the window. Please help with advise. Had a sister who had to contend with a baseboard heater however hers was located on the wall beside a patio door. Problem was solved by adding evenly spaced small cup hooks on the wall with clear plastic rings (used in the construction of Roman Shades) sewn to the hemline of the floor length drape which enabled her to hook ‘the width of the panel’ up when the baseboard heater was on during the winter months. She then placed an armchair strategically in front of it to hide it. Worked like a charm … ☺…. and in your case you could do similar. To conclude, the key is to ensure ‘the width of the panel’ to be hooked up is separate from the rest when the curtain is closed plus place a piece of furniture in front of it if you can. Also if I recall correctly, the curtain header we used was triple pleated and suspended on a rod that contained rings with a wand/baton. (In other words, it was NOT a traverse rod with a cord.) Hope this helps. I do love those braided ones! It looks like it is vertical fabric strips looped at the top and then an extra horizontal strip woven through every other vertical strip! on the braided curtains,they look very easy to make if someone want to know how to make them please feel free to contact me and I will give you step by step instructions. I’s best if you just e-mail me. I love to do projects like this. I just don’t have enough rooms in my home to do every project I run across. I would Love the step by step instructions for these braided draperies please?!? I absolutely Love Them! Thank You So Much for sharing your knowledge w the rest of us! Sorry Meg, as we mentioned in the post, we could not find a tutorial for those! Anyone? I am in love with these braided curtains! I have searched and searched for a tutorial on how to make these baby’s. I would love some step by step instructions. If you have step by step instructions you are willing to share on the braided curtains I would love to have it. Thank you! I couldn’t find your email & I do hope you will check back here & give me the instructions to make these!!! Would love them in my bedroom!!! 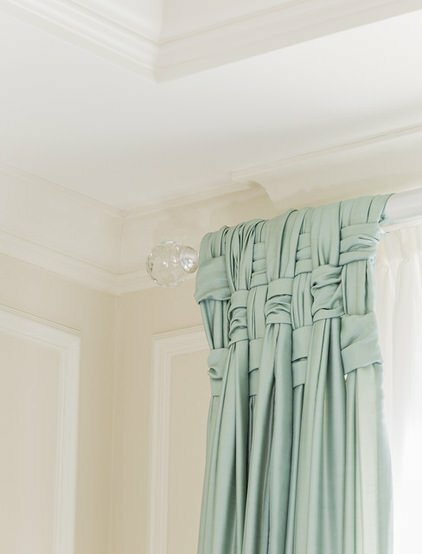 As we mentioned in the article, we could not find a tutorial for those drapes as they were made by a drapery showroom, but are looking for and hoping to find a DIY version! Will update when we do! Thanks for the posting, Kathy! There are so many great ideas here and braided ones are so cute! Michelle, I would love to learn the technique as well if you could share with my email, too! I’m moving into a new apartment with a large, three-panel sliding door window next week. Please let me know if you could share your knowledge and DIY magic!! Can you email me those directions? I tried and tried to figure out these braided curtains. Came close, but was never quite satisfied. Would love directions. I’d love instructions on these braided curtains if you still have them!! I’d love a step by step guide to the braided curtains!!! I’d love to see if I could manage this braided curtain for my massage room. I was just going to do a swag, but this would be so cool. I’d love to get any instructions if you have them. Hi. I’d love to know how to do the braided curtains. I would love to know how tomake these!! Wow!!! Thank you. The gold leaf curtain is stunning and no sew. The rose gold idea sounds get too. I think the weave is for a rag rug, I would start there. Such clever ideas! Especially love the curtains with the ruffle at the bottom. Thanks for sharing. You know that if you USE liquid embroidery paints things CAN be easier to do some of the painting arts, and THEY EVEN can be bleached and IT DOESN’T fade the colors a bit. I used to paint ON pillow cases and t-shirts for gifts. In fact I STILL HAVE a white slip THAT was painted BACK when I was a Little girl and the painted parts ARE AS bright and beautiful as it was BACK then, BUT the slip fell apart after 51years!!! I WAS 5WHEN I started wearing IT and I’m GOING ON 57years old in less than 6 months NOW. You should give IT a try and SEE how you LIKE it. Oh and the BEST parts were that ONCE dry IT wasn’t as stiff as painting twice and you are ABLE to paint tiny and large. Maybe NOT AS large as those bold large stripes. I HAVE BEEN using it for at least a CENTURY and I STILL ? using it for projects and making presents with those paints. Give it a try and LET ME KNOW what you think. Ok? Thanks Summer, they are so cute! Your cafe curtains are beautiful! I’m going to do they in our kitchen for our window over the sink!